Years of Charity work has lead to Mio the Magician being featured in a variety of print and online publications highlighting his work. One of his most recent acknowledgements came in the form of the article below by the “Celebritarian” an online publication that highlights the work of celebrity humanitarians world wide. The article is as follows. Enjoy the read. Mio the Magician has shocked, baffled and left speechless: billionaires, millionaires, rap stars, rock stars, supermodels, strangers on the street and Hollywood’s elite with his magic tricks. 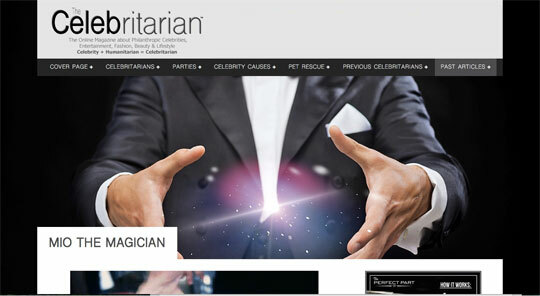 For over a decade, the Miami based illusionist has been on the NBA’s speed dial to entertain some of it’s biggest basketball stars, and he was the center of attention at Donna Karan’s New York apartment, where his mind blowing skills astonished Woody Allen, Robert DeNiro and Barbra Streisand at her star-studded birthday party. “You got the King with the king!” said Pat Riley, Miami Heat President, referring to an amazed LeBron James, when an upside-down king of spades instantly appeared as he thought of it. Mio has also become a sought after team building specialist for large corporations, including key brands like Citibank, American Express, IBM, AT&T, GE, PepsiCo, UPS and Delta. “Send me an image mentally,” is all he will ask of an employee at a conference he is appearing at. In a matter of seconds, with no other clues given to him, he will tell them exactly what they were thinking or which card they had a vision of. At private performances, screams will inevitably erupt from the audience when the very same card with a hand-written note on it suddenly appears in a sealed envelope moments after lying on the table, or when they witness a floating soap bubble turn into a glass ball in less than the blink of an eye. While Mio enjoys performing for celebrities and corporations around the world, his humanitarian work is always at the forefront of where he chooses to spend his professional time. As a supporter of The Ronald McDonald House; which provides a home to families with seriously ill children in the hospital, Mio arrives with fun and child friendly magic tricks and games, to uplift everyone in the room. Senior citizens living in a retirement home wait to see how he will mystify them on their birthdays, and at risk children at the Boys & Girls Club appreciate his inspiring shows each time he visits. Whether he is mesmerizing Hugh Jackman with a deck of cards, levitating a crumpled up dollar bill, or giving joy and laughter to people fighting life threatening diseases at “Friends In Deed;” a crisis center that provides emotional and spiritual support for anyone diagnosed with life-threatening physical illnesses, Mio deserves an award for all of the smiles he has brought to people around the world. For many, that alone can be worth more than gold. If your organization would like to do an article, news piece or interview with Mio about his charity work please contact Mio at https://www.magicbymio.com/contact-mio/ .